it´s jinxed... every time I try to finish commissions somebody shows up and wants things needed now, yesterday, asap, one year ago. Dang! Last week-end Ty and me visited my family. Of course most of the time Ty or me or we both pampered Kiki, my cat. She lives at my parents since I moved to Berlin 7 years ago. I didn´t want her to live in an flat while she has a home including huge garden @ my parents. So every time i´m there she gets pampered and cuddled (and secretly fed) alot. I think we both have a big Kiki-obsession. 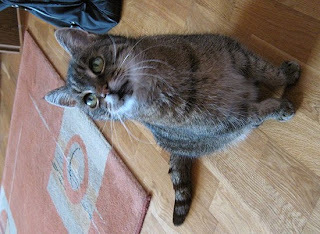 Kiki´s often called "Tretel" ("Treadle") since she´s milk-treading a lot even after nearly 17 years. Kiki is in both "Kulla" books... mah famous little snorring cat who always claims the center of the bed. ...and the last will be released this year as well. Wee! 2 appointments on Saturday (14th of March). The final time wasn´t offically released yet. 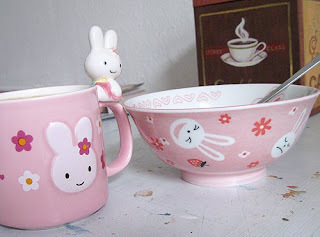 bunny dishes... cute, aren´t they? Funny Nata gave me those as a belated birthday present. Two years ago I gave the same bowl to Maike as a birthday present... what a coincidence XD The table is my old painting table... 6 years of color stains. I hope i can keep the table when I move. I like it... Kulla book one was made on it. When do you know that the colors are dry? When the canvas doesn´t feel cold anymore. When the colors dry the surface gets colder than usual. The temperature drops and gets back to normal when the colors are relatively dry again. Up from that point you can add more layers without ripping the recent color layer off (yeah, that might happen... or you get blotches... especially when working with a sponge). The book got excellent reviews and that´s why I bought the book. I thought: k.... seems like you can learn a bit more about techniques. This is my very personal opinion: Don´t buy it. Ever. I was so dissapointed. I didn´t wanna have lotsa pictures with techniques you never gonna use while doing illustrations. It´s more a compilation of different techniques for combining metal, acrylics, oils, pastels... whatever. 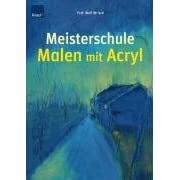 I had no clue what the book should be called: Combine everything you find in your supplier´s shop or "Learn everything about material... except acrylics". The book is perfect for people who want to experiment with different materials... really. Artistic allrounders might be happy with the book. Artists who wanna learn how to actually paint: No way. I have no idea what to do with the book... throwing away would be a shame. Hello ebay? 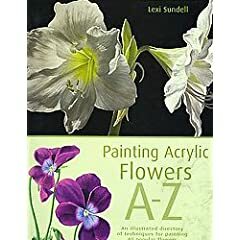 That book might be perfect for people who wanna learn how to paint photorealistic flowers. Sometimes I thought: "Well, she has to use photos.. can´t be!" If she doesn´t... total respect, most illustrations are truely beautiful and Lexi Sundell knows how to explain her steps well. I think it´s a good book to learn basic things about shading and why you might use color xy instead of the one you wanted to use. The illustrations show how to work in a very neat and controlled manner of painting. I would even say: The book is good for beginners. Maybe the wrong theme since flowers aren´t that easy to do (except.. if you have a nice photo and want to adapt that), but basically totally okay. What I liked most about that book and the previous books was the list of material and colors you need per illustration. Most beginners struggle to find the fitting shades and buy everything (like me.. except I strongly try to convince myself that I really need those ^^; ). If you wanna try out acrylics and follow Lexi Sundell step by step you get an overview, the color shades you need and which brushes. That´s good. but again... the basic things like bristle vrs. other brushes was too short for my taste. Maybe I am really looking for a book made for total idiots but I think basics are too important to give only a short introduction. Regarding palettes: Three out of four authors favour the "wet-towel" palette. Why??? I mean, if I use colors, I put only a small amount on my palette, start mixing the final shade and put on new color if I need the shade again. 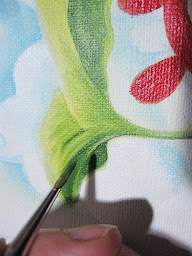 The colors will dry on the canvas anyway, so what´s the point of putting a huge amount of acrylics on a wet paper/fabric if you could leave them in their tubes/jars. o_o??? You can´t even mix on that palette but have to put it onto your final palette anyway. Sense? Am I the only one thinking that´s everything but economic. 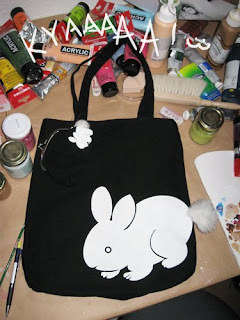 I am so pathetic but isn´t it cute O_____O (and yes, the plush is ON the tote). It´s too small to get anything but a purse (which has the same look :D ) and a book in but well, I can deal with that... eventually. If I ever gonna use it. C&A, 9 Euro... didn´t hurt that much. Worth the fun looking at it. Finally my shirt gave up. 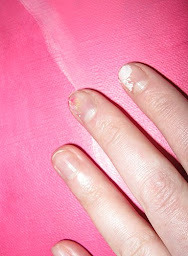 Scrubbing along the table edge all day long seems to be a bad idea for thinner fabric. 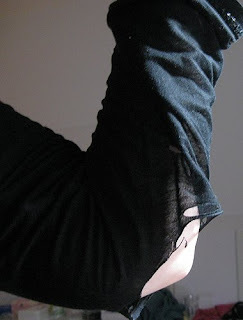 Totally destroyed my shirt *and I really liked it*. Bye shirt, you and me... we had a lot of fun, stains, coffee and tears while working late at night. 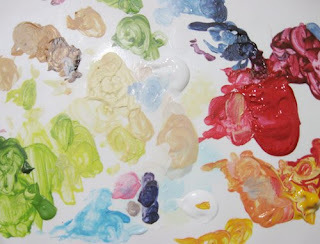 my actual palette.. ok, I have no idea why I thought I might need tons of red but... well, you can´t know. 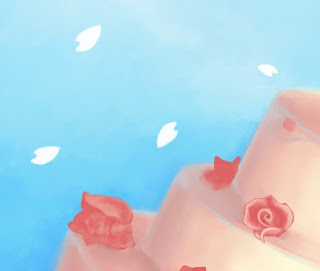 I have been working on a promo-illu for two days. Together with a lot of "normal" work I feel like I´m gonna fall asleep as soon as I hit my bed.